UTV and ATV Implements Guide. 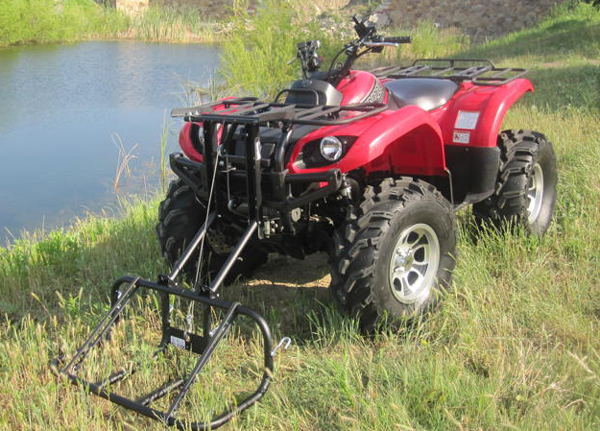 What kinds of things can you do with UTV and ATV implements? That's the question this guide aims to answer. 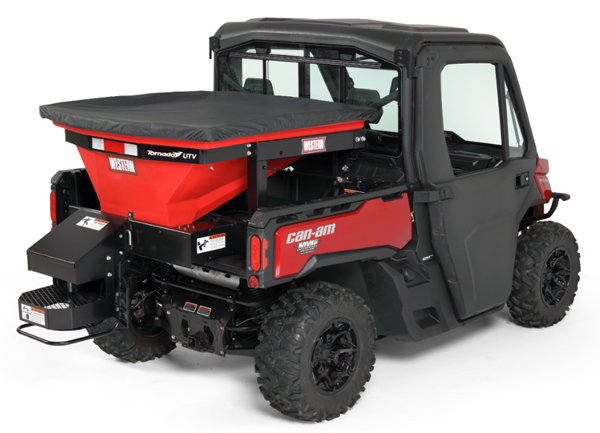 It's not a detailed list of every UTV and ATV implement for sale. It's more of an overview of all the tools and attachments that can be used by your ATV to get an amazing variety of work done. The most popular of all the ATV implements. ATV snow plows come in two basic styles. Straight blade and V-blade. They come in a variety of sizes to fit just about any UTV and most medium to large ATVs. They range from very basic manually adjustable models to multi-adjustable hydraulically controlled V-blades. More about ATV snow plows. More about UTV snow plows. 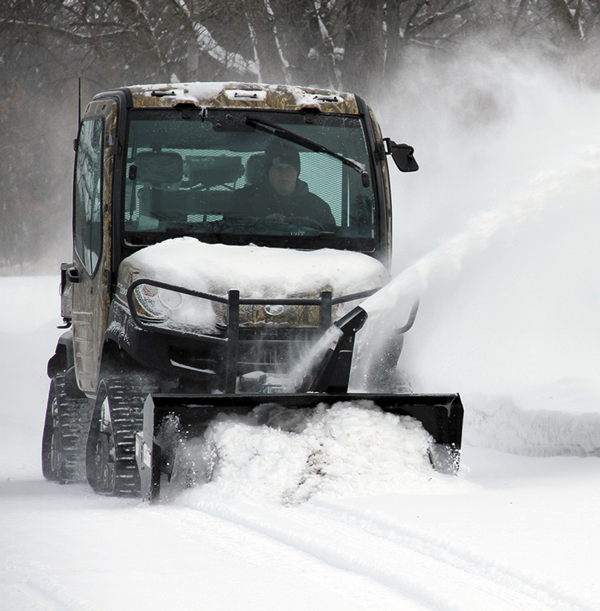 UTV Snowblowers are becoming more popular. When a snow plow isn't enough or you need to "throw" snow to avoid making a snow bank with a plow. These are usually front mounted to a frame that fits underneath the UTV or ATV. They will have their own small engine to power the blades that cut through and move the snow. Most will have some kind of rotating chute that can direct the snow as it's being blown out. Unlike the snow plows with only two styles, there seems to be an ATV plow for moving dirt in almost any way imaginable. A trend that's becoming more popular is combining two or more functions in one implement. These "combo plows" can save a lot of time by doing several things in one pass. ATV Disc Plow - The most common of the dirt moving ATV implements. They come in a wide variety of styles. From a basic single row of disc blades to large multi-row "gang" disc plows. Discs are popular as the base tool in many types of combo plows. They can be combined with chisel plows, cultivators, harrows, and dirt rakes to get more done in less time. 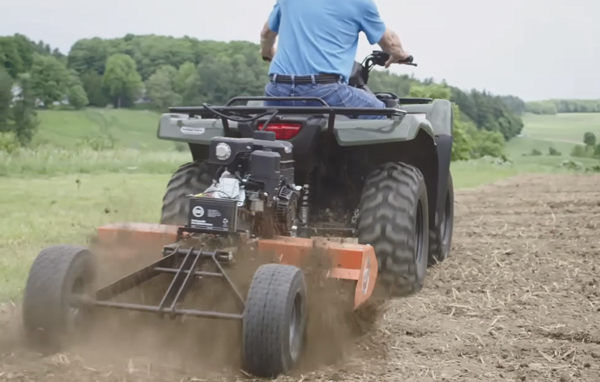 ATV Harrow - The traditional pull behind harrow usually consists of a box frame with multiple small tines or "spikes" designed to break dirt up into small pieces and create a smoother surface. ATV Disc Harrow - These are the most popular combo plow, with disc blades and harrow tines installed in the same frame to break dirt up more efficiently with each pass. Powered pull behind ATV tiller. ATV Tiller - These ATV attachments are self contained pull behind units. Most will have a separate small engine to power the rotating tiller blades. We have seen a few that use a PTO (power take off) option but they're rare and seem overly complicated. Cultivator - The cultivators for UTVs and ATVs fit between the harrow and chisel plow. Similar to the harrow, but with heavier cutting blades than the tines of the harrow. But not as heavy duty as the cutting blades of the chisel plow. ATV Cultipacker - A pull behind roller with spikes or teeth for breaking up, smoothing, and compacting soil. Many have a provision for adding ballast weight for better compacting. ATV Chisel Plow - Another pull behind ATV attachment. These have heavier, multiple chisel shaped cutting blades installed on various size frames. They dig deeper than cultivators and will require a larger and more powerful UTV or ATV to pull the bigger models. Commonly combined with disc blades as a combo plow. ATV Garden Plow / Mold Plow - Designed to trench soil at deeper depths and turn it as the plow moves forward. Normally used on soil that hasn't been tilled recently and may need to cut under grass roots. These take some power to pull and weight to keep the plow in the ground. Blade - A straight scraper blade used for grading dirt. Models for front or rear mounting. Most have a way to adjust the angle of the blade. Similar to the snow plow blades, but usually smaller and made of stronger materials. Rake - ATV dirt rakes are used for smoothing surfaces after being roughed up by some other ATV implements. Most are a single blade with "teeth" like a garden rake. They are great for smoothing driveways, trails, walk paths, etc. Several combos are made with a rake blade behind cultivators, dirt blades, or disc blades. ATV Drag - A light duty ATV attachment for fine smoothing of dirt surfaces. They can be made in several styles depending on the desired finish. ATV sprayer with front and rear tanks and side and rear spray booms. One of the most useful ATV implements. Sprayers mounted on ATVs or UTVs can get in to much tighter spaces than conventional vehicles. Sprayers come in various sizes and usually consist of a tank with a pump connected to a spray hose or boom. Tanks have been relatively small for use on ATVs. UTVs with beds have made it possible to carry much larger tanks. 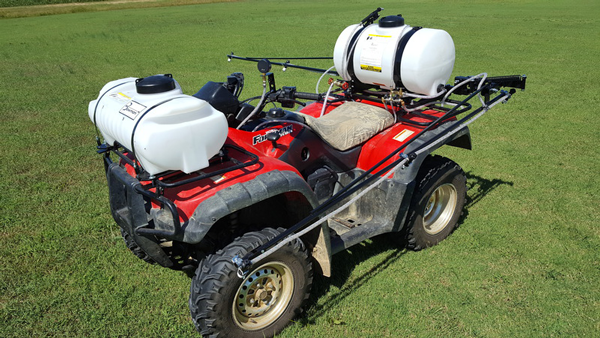 Spray booms can be located at the front, rear, or side of the four wheeler. Some models can be angled for spraying walls or other vertical surfaces. Pull behind ATV mower set up with side offset. ATV and UTV mowers are gaining popularity. Models can be front or rear mounted. They have a small engine mounted on board to power the cutting blades. 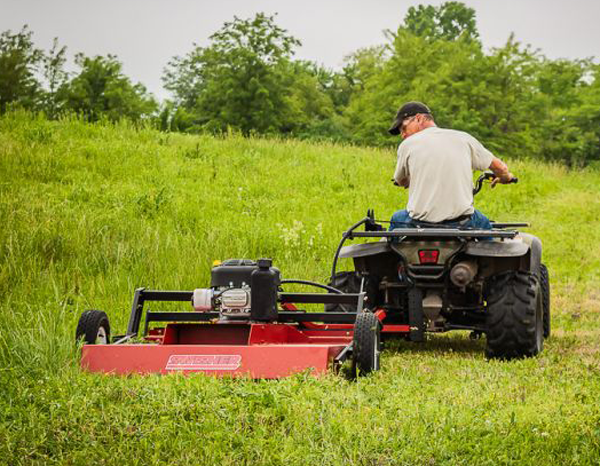 Tow behind mowers can usually be offset to run to one side or the other, along with straight behind the towing ATV. An advantage of front mounted mowers is the ability to lift them with the winch so they can be moved more easily. Some front mounted models use a rear mounted power unit to run a PTO shaft that connects to the front mounted mowing unit. Front end lift rack with winch lift. The most popular front end loaders are the bucket or box blade styles. Most use the winch and cable to lift and lower the bucket. Some more expensive models use optional hydraulics to provide bucket control. Another style of loader has forks or a combination of forks and a rack. These can do many of the jobs that a fork lift or pallet lift would do. Many hunters use the front rack lifts to carry larger game like deer. A combination of ATV trailer and ATV implement. Basically a trailer designed to haul medium size logs. Most have a hydraulically controlled loading arm with pincher grips for picking up the logs. ATV and UTV spreaders make short work of this job. They come in several sizes for almost any need. From a small bucket that sits on the rear rack of a small ATV to a full bed hopper for the bed of a UTV. Just fill up the hopper with whatever you need to spread, and drive around. What could be easier? Feeders range from a simple bucket that drops a pre-measured amount of food to a full pull behind trailer with feed chute for filling field troughs. 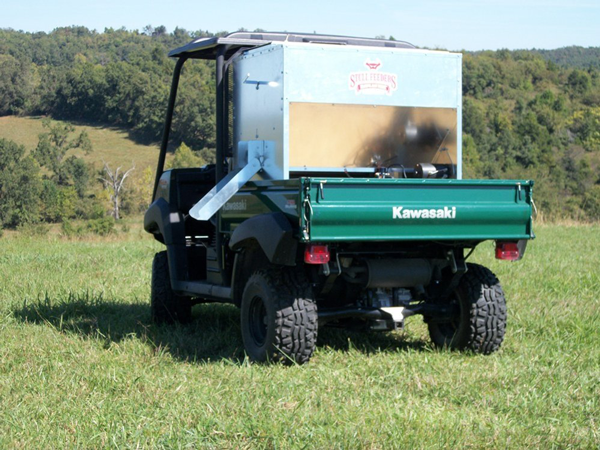 UTVs may be the best of both worlds with larger bed mounted hoppers, eliminating the need for a trailer. Pull behind ATV planter with multiple buckets. ATVs and UTVs work well with pull behind planters. Larger models can easily pull planters with multiple bucket mounts, making it possible to cover large areas quickly. We have some general guidelines for using ATV and UTV implement attachments. Driveline - While smaller and lighter two wheel drive models with air cooled engines can work with some ATV implements, for more serious work you'll need a more serious machine. Most ATV implements are designed to work at very slow speeds in situations with limited traction with relatively high loads. That will usually require a UTV or ATV with a liquid cooled engine for low speed cooling, 4 wheel drive for traction, and a transmission with a good low range coupled to an engine with serious power to handle the load. One of the reasons UTVs have been gaining in popularity is their ability to work well with these requirements. The versatility of UTVs has taken things to a level not possible before with ATVs. Power and Weight - For most UTV and ATV implements, more power and weight are better. Some of the lighter attachments may do fine with a smaller and lighter ATV, but anything beyond that will just be too much. Anything that adds weight or produces a drag will benefit greatly from more power and in most cases, more weight. Some implements will need ballast weight added to work effectively. UTVs do have an advantage with larger size and more weight carrying capacity. Many have larger engines and heavier duty drivelines. Their extra width and length provide added stability compared to an ATV. Suspension - Some implements can add a lot of weight to the ATV or UTV causing the stock springs to sag. Others may produce enough drag at the rear to sag the rear suspension. If these situations become a problem, you might have to install heavier springs and shocks to handle the increased load. Handling - Many of these implements can add a substantial amount of weight to one end of the ATV. This can make for some weird handling traits than can become dangerous at higher speeds. Most implements are intended for use at very low speeds, so it's not a problem. But for times when you need to move between work sites with a load, it's something to be aware of.